Compounds that target interleukin (IL)−6 pathways include antibodies against the IL-6 receptor or ligand, and inhibitors of IL-6 signal transduction. The anti-IL-6 receptor (IL-6R) monoclonal antibody tocilizumab has been licensed for several years; data from multiple studies demonstrate its efficacy and tolerability in rheumatoid arthritis as monotherapy or in combination with methotrexate. In addition, another anti-IL-6R monoclonal antibody, sarilumab, has recently been approved in both the US and EU. Anti-IL-6 monoclonal antibodies include olokizumab and clazakizumab, which both have data from phase II studies, as well as sirukumab which has completed phase III trials but may not be brought to the market. Comparative data for olokizumab versus tocilizumab intervention in rheumatoid arthritis suggest no difference in efficacy between blocking the receptor or the ligand. Head-to-head studies are needed to determine whether inhibition of the Janus kinase pathway is similar in its overall efficacy to direct inhibition of IL-6 or its receptor. The IL-6 inhibitors appear to be more effective when combined with methotrexate. However, they have shown superiority to tumour necrosis factor inhibitors when used as monotherapy, and may have an advantage in patients who cannot use methotrexate or any other conventional synthetic disease modifying anti-rheumatic drug. Regarding disease activity assessment, CDAI is a more appropriate measure than DAS28 when looking at the effect of IL-6 inhibition, as these agents interfere with the acute phase response, which is heavily weighted in the formula of DAS28. A panel of international experts in the field of rheumatology recently came together to consider the data for agents that target the IL-6 pathway. Compounds that target IL-6 pathways include antibodies against the IL-6 receptor such as tocilizumab, which has been licensed for almost a decade, and sarilumab, which has recently been approved in both the US and the EU.1 2 Antibodies against the IL-6 ligand have also been developed but have not yet been approved, including olokizumab and clazakizumab; the development of another anti-IL-6 antibody, sirukumab, has been stopped following a negative review from the FDA (see below). In addition, there are inhibitors of IL-6 signal transduction such as the Janus kinase (JAK) inhibitors baricitinib (licensed in the EU3 and US) and tofacitinib (licensed in the US and EU4 5). 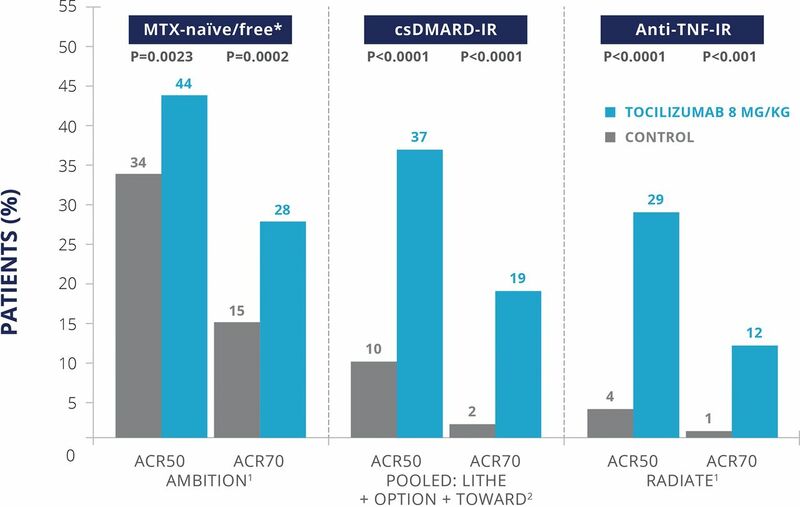 Tocilizumab ACR50 and ACR70 response rates at week 24.6 10 11 *MTX-naïve or MTX-free for 6 months before randomisation. DMARD-IR, disease modifying anti-rheumatic drug inadequate responders; TNF-IR, tumour necrosis factor inadequate responders. In the light of the FUNCTION results, it is of interest to compare DAS28 remission and ACR responses for therapies with different mechanisms of action. For example, with drugs that do not interfere directly with the acute phase response, such as abatacept (a T cell co-stimulation inhibitor) and rituximab (a B cell depleting agent), DAS28 remission occurs less frequently than ACR50 or ACR70 responses.17 18 However, with the IL-6 receptor inhibitor tocilizumab, DAS28 remission was more frequent than ACR70 response in OPTION and even more frequent than ACR50 in RADIATE.7 10 This has also sometimes been seen with TNF inhibitors, such as in the COMET trial in early rheumatoid arthritis.19 This may equate to the TNF control of IL-6 expression. It is self-evident that a measure allowing remission to be more frequent than a 70% (or even a 50%) improvement in response cannot be considered a valid endpoint for true remission. In clinical practice, such a measure could lead to therapy being stopped in patients with high residual disease activity. In this regard, it is essential to consider how the DAS28 score is determined. For example, the tender joint count is weighted twice as heavily as the swollen joint count.20 However, joint damage is associated more with swollen than tender joints. Similarly, erythrocyte sedimentation rate (ESR) is also highly weighted in the equation, such that an ESR at the upper limit of normal (20 mm/h) contributes two points, which is more than the contribution of 28 swollen joints.21 Importantly, the curve for ESR is steepest in the normal range (figure 2). Thus, it is essential to reflect on both the DAS28 score and the individual variables contributing to the overall clinical assessment when deciding on endpoints in clinical trials and practice. 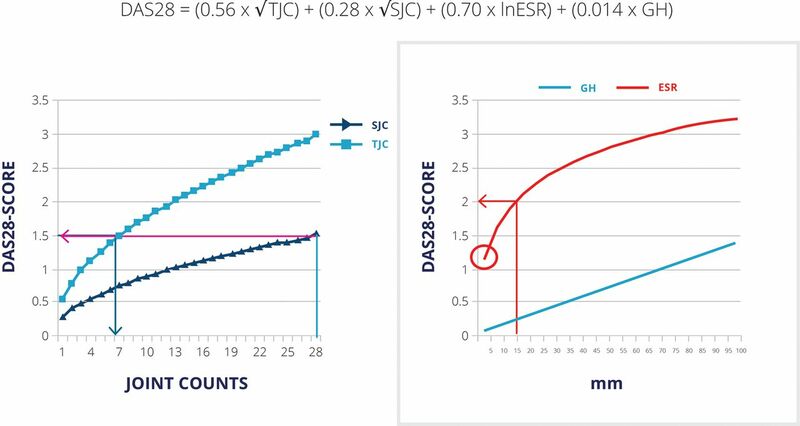 Problems with DAS28: contribution of individual variables across their whole respective range to the DAS28.20 21 ESR, erythrocyte sedimentation rate; GH, general health or patient’s global assessment of disease activity on a 100 mm visual analogue scale; SJC, swollen joint count; TJC, tender joint count. An analysis of patients in the tocilizumab clinical trials illustrates the problem.22 23 The 270 patients in the phase III studies who were in DAS28 remission were separated into those with CDAI remission, low disease activity (LDA), and moderate disease activity (MDA). While in patients with DAS28 remission exhibiting CDAI-MDA the tender joint count was approximately two, the swollen joint count was, on average, approximately 6, which is very high for patients to be in true remission (as defined by the term ‘DAS28 remission’). The reason for this is that the ESR was approximately 6 mm/h in patients in CDAI remission but 2 mm/h in those with MDA. This small deviation within the normal range masks the relevance of the six swollen joints in the clinical assessment and affects the DAS28 definition for ‘remission.’ CDAI is thus a more appropriate measure than DAS28 when looking at the effect of IL-6-directed inhibitors. This also has implications for choice of measures in treat-to-target strategies. Another phenomenon is seen when looking at DAS28 remission with JAK inhibitors. In this case, DAS28(CRP) remission occurs more than three times more frequently than DAS28(ESR) remission owing to different effects of JAK inhibition on CRP and ESR.24 This may be due to inhibition of JAK-2 as well as JAK-1, resulting in a lack of improvement in haemoglobin in some patients, with ESR remaining high. Sarilumab is a human monoclonal antibody against the IL-6 receptor. A phase II study showed suppression of CRP concentrations with higher doses of sarilumab.25 MOBILITY was a phase III study in which 1197 patients with moderate to severe rheumatoid arthritis (duration approximately 9 years) and an inadequate response to methotrexate were randomised to subcutaneous sarilumab 150 or 200 mg or placebo in combination with methotrexate for 52 weeks.26 Both doses of sarilumab achieved significantly higher ACR20, 50, and 70 responses at weeks 24 and 52 versus placebo, with some suggestion of a dose response (figure 3). Radiographic changes were also assessed, and progression of joint damage was significantly reduced by sarilumab, again with a suggestion of a dose response. MOBILITY: ACR20 co-primary endpoint at week 24.26 Patients aged 18–75 years who fulfilled the 1987 ACR revised criteria for rheumatoid arthritis and had active rheumatoid arthritis with diagnosis for ≥3 months despite MTX treatment. Rheumatoid arthritis as defined by swollen joint count ≥6 (out of 66), tender joint count ≥8 (out of 68), and high sensitivity CRP ≥0.6 mg/dL (upper limit of normal <0.6 mg/dL) *P<0.0001 vs placebo +MTX (results based on non-responder imputation). MTX, methotrexate; Q2W, every two weeks. The TARGET study evaluated the safety and efficacy of sarilumab plus csDMARD in 546 adults with active, moderate to severe rheumatoid arthritis with an inadequate response to or intolerance of at least one TNF inhibitor.27 As expected in this population, the ACR response rates were slightly lower than in MOBILITY. 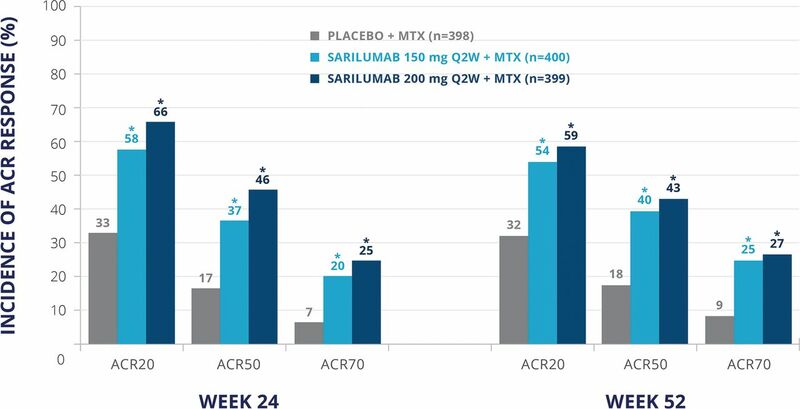 ACR20 response rates at week 24 were 33.7% for placebo, 55.8% for sarilumab 150 mg every other week, and 60.9% for sarilumab 200 mg every other week (both P<0.001 versus placebo); ACR50 responses were 18.2%, 37.0%, and 40.8%, respectively, and ACR70 responses were 7.2%, 19.9%, and 16.3%, respectively. Mean change from baseline in HAQ-DI score at week 12 was significantly greater for both sarilumab doses (–0.5 for both) than for placebo (–0.3) (P<0.001), and the incidence of CDAI LDA (CDAI≤10) at week 24 was significantly greater at 32.0% for 150 mg (P=0.0019) and 35.3% for 200 mg (P=0.0001), compared with 18.2% for placebo.27 In terms of safety, the profile was similar to that seen for tocilizumab, with a slight increase in liver enzymes, increases in lipid levels, occurrence of leucopenia in a proportion of patients (14%), and occasional thrombocytopenia. Finally, the MONARCH study looked at monotherapy with sarilumab versus adalimumab.28 As was seen with tocilizumab, the response rates were significantly higher with sarilumab monotherapy than with adalimumab monotherapy (figure 4). MONARCH: sarilumab versus adalimumab monotherapy.28 Incidence of (A) DAS28-ESR remission or LDA, (B) ACR20, ACR50 and ACR70 response from weeks 4 to 24, (C) CDAI remission or LDA and (D) HAQ-DI responders achieving ≥0.22 or ≥0.3 units of improvement in patients receiving adalimumab 40 mg q2w or sarilumab 200 mg q2w. 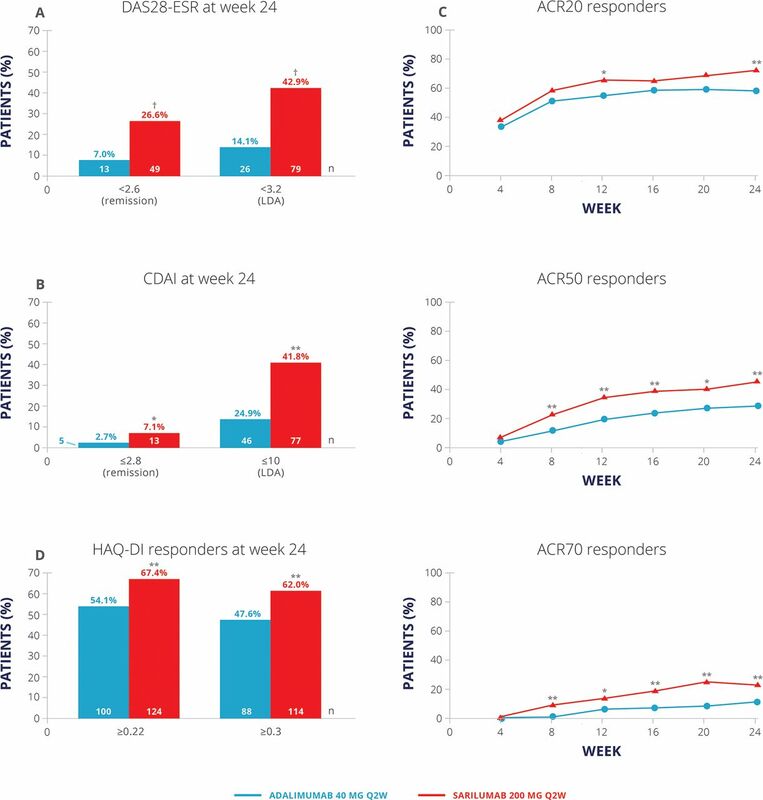 *p<0.05 versus adalimumab; **p<0.01 versus adalimumab (CDAI and HAQ-DI responders at week 24 are nominal p values); †p<0.0001 versus adalimumab. ACR, American College of Rheumatology; CDAI, Clinical Disease Activity Index; DAS28-ESR, 28-joint disease activity score using erythrocyte sedimentation rate; HAQ-DI, Health Assessment Questionnaire-Disability Index; LDA, low disease activity; q2w, every 2 weeks. To date, only phase II data are available for olokizumab and clazakizumab, which are both humanised monoclonal antibodies against IL-6. In a phase IIb study of olokizumab 60, 120, or 240 mg every 2 or 4 weeks in patients with rheumatoid arthritis with an inadequate response to TNF inhibitors, decreases from baseline in DAS28(CRP) were observed from week 1. There was some indication of a dose response, with the higher doses achieving a decrease in DAS28(CRP) comparable to that seen with tocilizumab 8 mg/kg every 4 weeks.29 Another phase II study in Japan looked at 60, 120, and 240 mg doses of olokizumab every 4 weeks compared with placebo in 119 patients with rheumatoid arthritis who had responded inadequately to TNF inhibitors.30 The baseline HAQ-DI score in this study was lower than is usually seen, with an overall median of 1.13. ACR response rates at week 12 were higher in the olokizumab treatment groups than with placebo, with all cumulative doses showing significant improvements. Safety data were similar to the anti-IL-6 receptor data. Olokizumab is now in phase III studies. In a phase IIb study, various doses of clazakizumab from 25 mg to 200 mg, with or without methotrexate, led to ACR20 responses at week 12 varying between 55% and 76% (compared with 39% for placebo and 76% for adalimumab plus methotrexate), with no clear dose-response pattern.31 The safety data at this stage looked similar to those for the anti-IL-6 receptor agents. Change from baseline in Sharp/van der Heijde score results at weeks 24 and 52.32 *P<0.001 versus placebo based on Van Der Waerden analysis of variance. q2w, every two weeks; q4w, every four weeks. SIRROUND-T randomised 878 patients refractory to TNF inhibitor (TNFi) therapy (lack of benefit from ≥1 or intolerance to ≥2 TNF inhibitors) to sirukumab 50 mg every 4 weeks or 100 mg every 2 weeks versus placebo.33 Patients continued any csDMARDs if they had been taking a stable dose for at least 4 weeks; previous exposure to non-TNFi biologics, including tocilizumab, was allowed. Overall, 27% of patients had received 3 or more previous biologics, 88% had discontinued TNF inhibitor therapy because of a lack of efficacy, and 19% were not taking a csDMARD at baseline. Approximately 12% of patients had previously taken tocilizumab. ACR responses were slightly lower than was seen in some of the studies of similar rheumatoid arthritis populations described for the other agents above, possibly owing to a relatively high proportion of patients not taking methotrexate or another csDMARD; ACR20 responses at week 24 were 42.8% for both sirukumab doses compared with 25.9% for placebo (P<0.001). 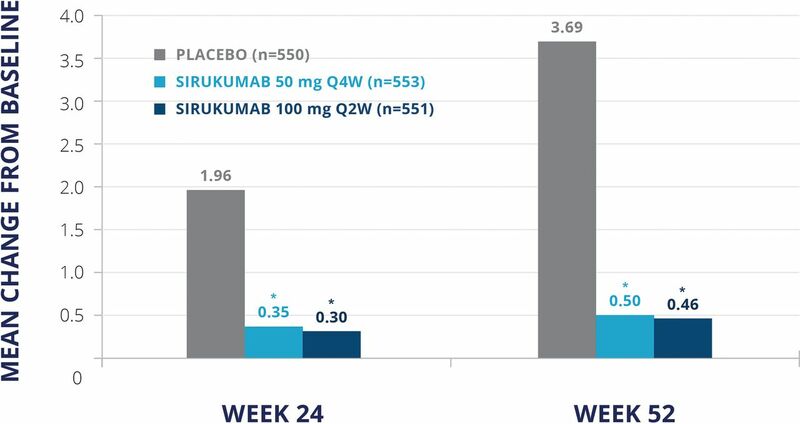 ACR50 and 70 responses, respectively, were 8.8% and 4.1% for placebo, 20.9% and 8.6% for sirukumab 50 mg every 4 weeks, and 21.6% and 9.9% for sirukumab 100 mg every 2 weeks.33 Mean change from baseline in HAQ-DI at week 24 was –0.125 for placebo, –0.314 for sirukumab 50 mg every 4 weeks, and –0.329 for sirukumab 100 mg every 2 weeks (both P<0.001 versus placebo). The safety profile was as expected, with some abnormalities in liver enzymes, haematology results, and lipids but no apparent relation to dose. However, while there were no deaths in any arm the first 24 weeks, the placebo-controlled phase, five deaths occurred in the subsequent 24 weeks, a finding that suggested some potential imbalance similar to the SIRROUND-D trial. As previously mentioned, sirukumab development and registration has been halted following negative review from the FDA. It will be interesting in the future to see head-to-head studies to determine whether inhibition of the JAK pathway is similar in its overall efficacy to direct inhibition of IL-6 or its receptor. One difference observed is that currently approved JAK inhibitors do not usually improve anaemia, probably owing to interference with JAK2. With any biologic, the best predictor of long-term response appears to be early response. It is also the case that patients with high TNF concentrations need higher doses of TNF inhibitors to achieve a good response.39 Similarly, it seems that the amount of IL-6 receptor is correlated with response to IL-6 inhibitors, with a lower response in patients with higher receptor concentrations. We note that higher doses of TNF inhibitors are used in gastroenterology than in rheumatology, and seem to be well tolerated, so there may be a case for trying higher doses of some biologics in patients with an insufficient response to lower doses. Targeting the IL-6 pathway is not a new approach—although the anti-IL-6 receptor inhibitor sarilumab and the IL-6 signal transduction inhibitors tofacitinib and baricitinib have recently been approved, the anti-IL-6 receptor inhibitor tocilizumab has been licensed for nearly 10 years. Anti-IL-6 ligand antibodies have now also been developed with apparent similar efficacy to blocking the IL-6 receptor. Of importance to those patients who cannot use methotrexate or other csDMARDS, a review of the data suggests that anti-IL-6 pathway agents seem to be more effective as monotherapy than TNF inhibitors. However, when reviewing the data with respect to the overall clinical assessment, the disease score and its contributing parameters should be considered to ensure that valid endpoints are used. FH-LR Ltd. FH-LR Ltd Pooled analysis: lithe, option, toward. In: , ed.
. Tocilizumab in combination therapy and monotherapy versus methotrexate in methotrexate-naive patients with early rheumatoid arthritis: clinical and radiographic outcomes from a randomized, placebo-controlled trial. Arthritis Rheum 2013;65:S1182–3.
. The assessment of disease activity in rheumatoid arthritis. Clin Exp Rheumatol 2010;28(3 Suppl 59):S18–27.
. Efficacy and safety of monotherapy with sirukumab, an anti–IL-6 Cytokine monoclonal antibody, compared with adalimumab monotherapy in biologic-naive patients with active rheumatoid arthritis: results of a global, randomized, double-blind, parallel-group, phase 3 Study. Arthritis Rheumatol 2016;68.